We offer awesome local Gift Certificates redeemable at tons of our partner businesses in Downtown Hartsville. Gift certificates can be ordered in any amount above $10. 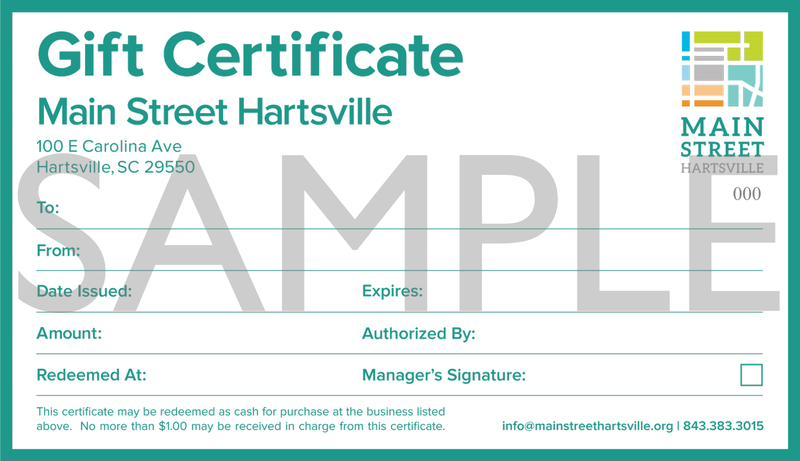 Gift Certificates are available in the Main Street Hartsville office in The Key, Hartsville’s Visitors Center, at 106 E Carolina Ave, by phone at (843) 383.3015, by email at info@mainstreethartsville.org, or with easy online ordering and payment below. Buy gift certificates online with secure payment processing through PayPal. All major credit and debit cards and e-checks are accepted; you do not need a PayPal account to pay. Pay online to buy MSH Gift Certificates. How much should the certificate(s) be worth? How many certificates would you like to order? You can pick up your order at the Main Street office in City Hall for free. To have them shipped, there's a fee of $5.75 for Priority Mail. If you'd like your ordered delivered to you, please include the full shipping address here. If ordering multiple gift certificates, list the names of the individuals they are for here. Also, include any other notes or instructions here. Main Street Hartsville is a partner organization of the City of Hartsville. For questions about deductions, please consult your tax advisor.